Computes similarity between two images to be registered. This metric computes the correlation between pixels in the fixed image and pixels in the moving image. The spatial correspondance between fixed and moving image is established through a Transform. Pixel values are taken from the fixed image, their positions are mapped to the moving image and result in general in non-grid position on it. Values at these non-grid position of the moving image are interpolated using a user-selected Interpolator. The correlation is normalized by the autocorrelations of both the fixed and moving images. Definition at line 42 of file itkNormalizedCorrelationImageToImageMetric.h. Definition at line 442 of file itkOptImageToImageMetric.h. If a BSplineInterpolationFunction is used, this class obtain image derivatives from the BSpline interpolator. Otherwise, image derivatives are computed using central differencing. Definition at line 453 of file itkOptImageToImageMetric.h. Definition at line 445 of file itkOptImageToImageMetric.h. Reimplemented in itk::MattesMutualInformationImageToImageMetric< TFixedImage, TMovingImage >. Definition at line 437 of file itkOptImageToImageMetric.h. Definition at line 439 of file itkOptImageToImageMetric.h. Definition at line 430 of file itkOptImageToImageMetric.h. Definition at line 434 of file itkOptImageToImageMetric.h. Definition at line 432 of file itkOptImageToImageMetric.h. Reimplemented from itk::ImageToImageMetric< TFixedImage, TMovingImage >. Definition at line 52 of file itkNormalizedCorrelationImageToImageMetric.h. Reimplemented in itk::MattesMutualInformationImageToImageMetric< TFixedImage, TMovingImage >, itk::MattesMutualInformationImageToImageMetric< TFixedImage, TMovingImage >, and itk::MeanSquaresImageToImageMetric< TFixedImage, TMovingImage >. Definition at line 70 of file itkOptImageToImageMetric.h. Definition at line 70 of file itkImageToImageMetric.h. Typedefs for using central difference calculator. Definition at line 458 of file itkOptImageToImageMetric.h. Definition at line 72 of file itkNormalizedCorrelationImageToImageMetric.h. Definition at line 75 of file itkNormalizedCorrelationImageToImageMetric.h. Definition at line 114 of file itkOptImageToImageMetric.h. Index and Point typedef support. Reimplemented in itk::MattesMutualInformationImageToImageMetric< TFixedImage, TMovingImage >, and itk::MutualInformationImageToImageMetric< TFixedImage, TMovingImage >. Definition at line 108 of file itkOptImageToImageMetric.h. Definition at line 109 of file itkOptImageToImageMetric.h. Definition at line 146 of file itkOptImageToImageMetric.h. Definition at line 145 of file itkOptImageToImageMetric.h. Definition at line 136 of file itkImageToImageMetric.h. Definition at line 144 of file itkOptImageToImageMetric.h. Definition at line 135 of file itkImageToImageMetric.h. Reimplemented in itk::GradientDifferenceImageToImageMetric< TFixedImage, TMovingImage >, and itk::HistogramImageToImageMetric< TFixedImage, TMovingImage >. Definition at line 82 of file itkOptImageToImageMetric.h. Reimplemented in itk::MattesMutualInformationImageToImageMetric< TFixedImage, TMovingImage >, itk::MutualInformationImageToImageMetric< TFixedImage, TMovingImage >, and itk::MeanSquaresImageToImageMetric< TFixedImage, TMovingImage >. Definition at line 111 of file itkOptImageToImageMetric.h. Reimplemented in itk::CompareHistogramImageToImageMetric< TFixedImage, TMovingImage >, itk::KappaStatisticImageToImageMetric< TFixedImage, TMovingImage >, itk::MatchCardinalityImageToImageMetric< TFixedImage, TMovingImage >, and itk::MatchCardinalityImageToImageMetric< TFixedImage, TMovingImage >. Definition at line 84 of file itkOptImageToImageMetric.h. Definition at line 83 of file itkImageToImageMetric.h. Reimplemented in itk::MattesMutualInformationImageToImageMetric< TFixedImage, TMovingImage >, and itk::MeanSquaresImageToImageMetric< TFixedImage, TMovingImage >. Definition at line 366 of file itkOptImageToImageMetric.h. Type of the fixed Image. Definition at line 73 of file itkNormalizedCorrelationImageToImageMetric.h. Definition at line 134 of file itkOptImageToImageMetric.h. Definition at line 125 of file itkImageToImageMetric.h. Definition at line 133 of file itkOptImageToImageMetric.h. Definition at line 124 of file itkImageToImageMetric.h. Definition at line 130 of file itkOptImageToImageMetric.h. Definition at line 121 of file itkImageToImageMetric.h. Reimplemented in itk::KappaStatisticImageToImageMetric< TFixedImage, TMovingImage >, and itk::MeanSquaresImageToImageMetric< TFixedImage, TMovingImage >. Definition at line 129 of file itkOptImageToImageMetric.h. Definition at line 120 of file itkImageToImageMetric.h. Definition at line 67 of file itkNormalizedCorrelationImageToImageMetric.h. Definition at line 461 of file itkOptImageToImageMetric.h. Definition at line 438 of file itkOptImageToImageMetric.h. Definition at line 69 of file itkNormalizedCorrelationImageToImageMetric.h. Reimplemented in itk::CompareHistogramImageToImageMetric< TFixedImage, TMovingImage >, and itk::KullbackLeiblerCompareHistogramImageToImageMetric< TFixedImage, TMovingImage >. Definition at line 138 of file itkOptImageToImageMetric.h. Definition at line 129 of file itkImageToImageMetric.h. Reimplemented in itk::CompareHistogramImageToImageMetric< TFixedImage, TMovingImage >, itk::KullbackLeiblerCompareHistogramImageToImageMetric< TFixedImage, TMovingImage >, itk::MattesMutualInformationImageToImageMetric< TFixedImage, TMovingImage >, itk::MutualInformationImageToImageMetric< TFixedImage, TMovingImage >, itk::MattesMutualInformationImageToImageMetric< TFixedImage, TMovingImage >, and itk::MeanSquaresImageToImageMetric< TFixedImage, TMovingImage >. Definition at line 119 of file itkOptImageToImageMetric.h. Definition at line 109 of file itkImageToImageMetric.h. Definition at line 71 of file itkNormalizedCorrelationImageToImageMetric.h. Definition at line 76 of file itkNormalizedCorrelationImageToImageMetric.h. Definition at line 110 of file itkOptImageToImageMetric.h. Definition at line 153 of file itkOptImageToImageMetric.h. Definition at line 152 of file itkOptImageToImageMetric.h. Definition at line 142 of file itkImageToImageMetric.h. Definition at line 151 of file itkOptImageToImageMetric.h. Definition at line 141 of file itkImageToImageMetric.h. Reimplemented in itk::HistogramImageToImageMetric< TFixedImage, TMovingImage >. Definition at line 77 of file itkOptImageToImageMetric.h. Definition at line 77 of file itkImageToImageMetric.h. Definition at line 441 of file itkOptImageToImageMetric.h. 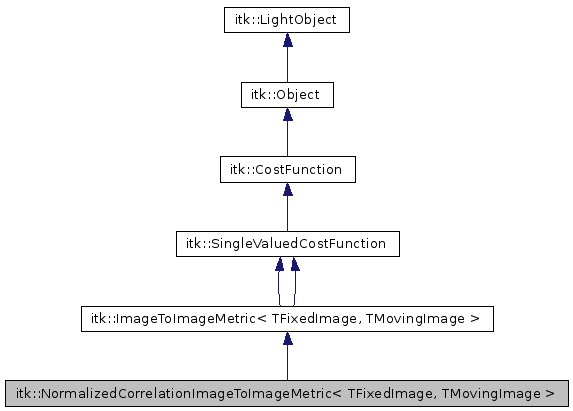 Reimplemented in itk::MattesMutualInformationImageToImageMetric< TFixedImage, TMovingImage >, itk::MutualInformationImageToImageMetric< TFixedImage, TMovingImage >, itk::MattesMutualInformationImageToImageMetric< TFixedImage, TMovingImage >, and itk::MeanSquaresImageToImageMetric< TFixedImage, TMovingImage >. Definition at line 112 of file itkOptImageToImageMetric.h. Type of the moving Image. Definition at line 74 of file itkNormalizedCorrelationImageToImageMetric.h. Definition at line 518 of file itkOptImageToImageMetric.h. Definition at line 68 of file itkNormalizedCorrelationImageToImageMetric.h. Definition at line 163 of file itkOptImageToImageMetric.h. Definition at line 152 of file itkImageToImageMetric.h. ParametersType typedef. It defines a position in the optimization search space. Definition at line 46 of file itkCostFunction.h. Definition at line 51 of file itkNormalizedCorrelationImageToImageMetric.h. Definition at line 58 of file itkNormalizedCorrelationImageToImageMetric.h. Definition at line 48 of file itkNormalizedCorrelationImageToImageMetric.h. Definition at line 49 of file itkNormalizedCorrelationImageToImageMetric.h. Definition at line 66 of file itkNormalizedCorrelationImageToImageMetric.h. Definition at line 65 of file itkNormalizedCorrelationImageToImageMetric.h. Definition at line 64 of file itkNormalizedCorrelationImageToImageMetric.h. Definition at line 63 of file itkNormalizedCorrelationImageToImageMetric.h. Definition at line 433 of file itkOptImageToImageMetric.h. Definition at line 101 of file itkNormalizedCorrelationImageToImageMetric.h. Reimplemented in itk::KappaStatisticImageToImageMetric< TFixedImage, TMovingImage >. Compute image derivatives at a point. This method returns the derivative of the cost function corresponding to the specified parameters. Implemented in itk::Statistics::GoodnessOfFitMixtureModelCostFunction< TInputSample >. Get the derivatives of the match measure. Get a pointer to the Interpolator. Get the number of pixels considered in the computation. Definition at line 238 of file itkOptImageToImageMetric.h. Definition at line 213 of file itkImageToImageMetric.h. Definition at line 191 of file itkOptImageToImageMetric.h. Definition at line 274 of file itkOptImageToImageMetric.h. Reimplemented in itk::MatchCardinalityImageToImageMetric< TFixedImage, TMovingImage >. Get a pointer to the Transform. This method returns the value of the cost function corresponding to the specified parameters. Get the value for single valued optimizers. Definition at line 71 of file itkSingleValuedCostFunction.h. Get value and derivatives for multiple valued optimizers. Definition at line 594 of file itkOptImageToImageMetric.h. Definition at line 582 of file itkOptImageToImageMetric.h. Definition at line 584 of file itkOptImageToImageMetric.h. Definition at line 552 of file itkOptImageToImageMetric.h. Definition at line 546 of file itkOptImageToImageMetric.h. Reimplemented in itk::CompareHistogramImageToImageMetric< TFixedImage, TMovingImage >, itk::GradientDifferenceImageToImageMetric< TFixedImage, TMovingImage >, itk::HistogramImageToImageMetric< TFixedImage, TMovingImage >, itk::KullbackLeiblerCompareHistogramImageToImageMetric< TFixedImage, TMovingImage >, itk::MattesMutualInformationImageToImageMetric< TFixedImage, TMovingImage >, itk::MattesMutualInformationImageToImageMetric< TFixedImage, TMovingImage >, and itk::MeanSquaresImageToImageMetric< TFixedImage, TMovingImage >. Reimplemented in itk::GradientDifferenceImageToImageMetric< TFixedImage, TMovingImage >. Update sample sizes for the threads. Reinitialize the seed of the random number generator that selects the sample of pixels used for estimating the image histograms and the joint histogram. By nature, this metric is not deterministic, since at each run it may select a different set of pixels. By initializing the random number generator seed to the same value you can restore determinism. On the other hand, calling the method ReinitializeSeed() without arguments will use the clock from your machine in order to have a very random initialization of the seed. This will indeed increase the non-deterministic behavior of the metric. Uniformly select a sample set from the fixed image domain. Gather all the pixels from the fixed image domain. Set/Get the fixed image mask. Set/Get the moving image mask. Definition at line 251 of file itkOptImageToImageMetric.h. Definition at line 270 of file itkOptImageToImageMetric.h. Set/Get number of threads to use for computations. Set/Get SubtractMean boolean. If true, the sample mean is subtracted from the sample values in the cross-correlation formula and typically results in narrower valleys in the cost fucntion. Default value is false. Set the parameters defining the Transform. Select whether the metric will be computed using all the pixels on the fixed image region, or only using a set of randomly selected pixels. This boolean flag is only relevant when this metric is used along with a BSplineDeformableTransform. The flag enables/disables the caching of values computed when a physical point is mapped through the BSplineDeformableTransform. In particular it will cache the values of the BSpline weights for that points, and the indexes indicating what BSpline-grid nodes are relevant for that specific point. This caching is made optional due to the fact that the memory arrays used for the caching can reach large sizes even for moderate image size problems. For example, for a 3D image of 256^3, using 20% of pixels, these arrays will take about 1 Gigabyte of RAM for storage. The ratio of computing time between using the cache or not using the cache can reach 1:5, meaning that using the caching can provide a five times speed up. It is therefore, interesting to enable the caching, if enough memory is available for it. The caching is enabled by default, in order to preserve backward compatibility with previous versions of ITK. Synchronizes the threader transforms with the transform member variable. Transform a point from FixedImage domain to MovingImage domain. This function also checks if mapped point is within support region. Definition at line 502 of file itkOptImageToImageMetric.h. Definition at line 471 of file itkOptImageToImageMetric.h. Definition at line 468 of file itkOptImageToImageMetric.h. Definition at line 464 of file itkOptImageToImageMetric.h. Definition at line 476 of file itkOptImageToImageMetric.h. Definition at line 467 of file itkOptImageToImageMetric.h. Definition at line 475 of file itkOptImageToImageMetric.h. Definition at line 466 of file itkOptImageToImageMetric.h. Definition at line 233 of file itkImageToImageMetric.h. Pointer to central difference calculator. Definition at line 505 of file itkOptImageToImageMetric.h. Definition at line 227 of file itkImageToImageMetric.h. Definition at line 361 of file itkOptImageToImageMetric.h. Definition at line 402 of file itkOptImageToImageMetric.h. Definition at line 236 of file itkImageToImageMetric.h. Container to store a set of points and fixed image values. Definition at line 379 of file itkOptImageToImageMetric.h. Definition at line 362 of file itkOptImageToImageMetric.h. Definition at line 234 of file itkImageToImageMetric.h. Definition at line 231 of file itkImageToImageMetric.h. Boolean to indicate if the interpolator BSpline. Definition at line 499 of file itkOptImageToImageMetric.h. Definition at line 228 of file itkImageToImageMetric.h. Definition at line 403 of file itkOptImageToImageMetric.h. Definition at line 237 of file itkImageToImageMetric.h. Definition at line 384 of file itkOptImageToImageMetric.h. Definition at line 385 of file itkOptImageToImageMetric.h. Definition at line 381 of file itkOptImageToImageMetric.h. Definition at line 225 of file itkImageToImageMetric.h. Definition at line 405 of file itkOptImageToImageMetric.h. The number of BSpline transform weights is the number of of parameter in the support region (per dimension ). Definition at line 424 of file itkOptImageToImageMetric.h. Definition at line 382 of file itkOptImageToImageMetric.h. Definition at line 411 of file itkOptImageToImageMetric.h. Definition at line 409 of file itkOptImageToImageMetric.h. Definition at line 525 of file itkOptImageToImageMetric.h. Definition at line 479 of file itkOptImageToImageMetric.h. Definition at line 478 of file itkOptImageToImageMetric.h. Definition at line 527 of file itkOptImageToImageMetric.h. Definition at line 529 of file itkOptImageToImageMetric.h. Definition at line 526 of file itkOptImageToImageMetric.h. Definition at line 528 of file itkOptImageToImageMetric.h. Copies of Transform helpers per thread (N-1 of them, since m_Transform will do the work for thread=0. Definition at line 395 of file itkOptImageToImageMetric.h. Definition at line 230 of file itkImageToImageMetric.h. Boolean to indicate if the transform is BSpline deformable. Definition at line 420 of file itkOptImageToImageMetric.h. Definition at line 407 of file itkOptImageToImageMetric.h. Definition at line 474 of file itkOptImageToImageMetric.h. Definition at line 360 of file itkOptImageToImageMetric.h. Definition at line 363 of file itkOptImageToImageMetric.h. Definition at line 469 of file itkOptImageToImageMetric.h. Definition at line 531 of file itkOptImageToImageMetric.h. Definition at line 530 of file itkOptImageToImageMetric.h.